Second, if you are not in our area, I challenge you to join Joel Home, Children’s Hope Chest, and us in prayer for these guys. 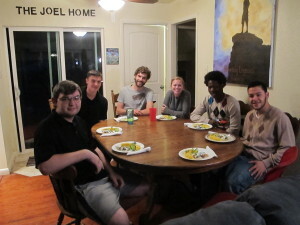 Brian and I have three guys living with us in Joel Home II and there are three guys living in Joel Home I. That’s a total of 6 young men who need to be covered in prayer and be lifted up as men. Will you commit to standing with us in their corner and encouraging them, supporting them, coaching them, and praying for them? Like Grandma Jo and her father, I pray these young men too will one day have children who, in their older age, are able to enrapture their family members by talking about the man their father was and the legacy he left behind.